This project started with grand plans for a full length publication on the second part of the life of Joe Jacobs . Very little happened over several months so I decided to produce a small book . This could in no way compare to the original autobiography, edited by Joes daughter Janet , but would at least record the basic facts and could be used in a bigger later publication . George Shaw, who has the remaining documents in a small archive, intends proceeding with this. In this little book we are concerned with Joes life from soon after the famous protest events in East London against the fascists. We start at 1940 and go though to his death in 1977. There were controversies, expulsions and a good deal of political conflict in his very full life. Before examining that more fully , it is necessary to make a brief survey the details of the earlier period , which forms the background,. The first volume deals exclusively with working class, predominately Jewish, life in the East End of London in the years between the first and second world wars. It is a fascinating chronicle of working class existence in that period and is something of a working class classic. . The book is straightforward and written in plain English, unlike much Left reportage, and is thorough and rich with a wealth of detail. 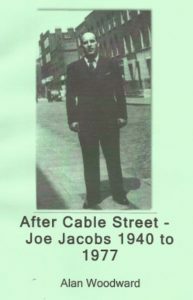 Joe Jacobs was born in 1913 in the East End of London, to Russian/ Jewish family. He endured terrible poverty and personal hardships while growing up. His father died a year after he was born and the family was constantly short of money. When Joe was 12, he lost an eye due to a medical problem. An elder sister was lost to TB in squalid circumstances and other family members existed in equally dire circumstances. Yet despite these situations, politics also seemed a constant. Through his father’s first wife, Joe had an elder brother he never met, who returned to Russia to take part in the Revolution. Dave had been a Bolshevik supporter, but later joined the “Workers Opposition” and eventually left Russia to live in Paris. Other snapshots of family and friends who drifted in and out of the East End socialist and political milieu are described in detail throughout the first book. Joe’s own introduction to politics came in 1925 when he was 12 and stumbled across a demonstration in support of the Jewish Bakers’ Union. Joe described his feeling as akin to a drug addict’s first fix: I was elated . . . most certainly something had entered my bloodstream. Joe also described being profoundly affected by the General Strike in 1926, especially after witnessing mounted police attacking a crowd with sticks. But it was in the Communist Party of Great Britain that Joe was to earn his political stripes. He was a loose contact of the Party, before joining the Young Communists . and later the adult party. It was to become the centre of his life. Joe vividly describes the tremendous variety of activities and organizations in which the Communist Party was involved. It is hard for those of us active today, to imagine the kind of influence the CP wielded. Joe loyally followed the line through all its political changes. Joe had a further criticism. He thought the CPGB was mis-directing its efforts into trying to capture the trade union structure instead of organising in the workplace which he favoured. But the CP dealt ruthlessly with its dissidents and Joe was expelled after a long battle . Social isolation followed but Joe had made his point and his ideas were to stay with him for the rest of his life. His expression of these ideas, through various organisations and bodies, is the theme of this document and though less exciting that the events of his first 26 years are just as important for those involved in the movement for social transformation. It is necessary to record that the construction of this publication has been a little held back by the absence of documents it is after all over 30 years since even the final events. Janet Simon, born Jacobs, and others has assisted with information but in no way wants any further responsibility for the present text about which she has reservations anyway . Notably absent are the letters from Joe to both Henri Simon and Cajo Brendel but his missives to them are available. No one has any knowledge of the former. Henri wishes to dissociate himself from the present approach though he did provide some basic information. Some of the original papers have been made available to all through the libcom.org website, which readers may well wish to consult. The sequence of the narrative is that Joes war time experience is looked at first , then his industrial experience , chiefly the occupation by clothing workers in a Central London factory under his leadership. Joes activities continued after retirement when he wrote extensive for Solidarity, which he had joined. Two contributions stand out , his account of the Post Office workers strike in 1971 he has been employed in the PO for a few years – and his booklet on the Fisher Bendix occupation in 1972 . A political row came out of this but Joe and Solidarity were vindicated in the end . Joe became interested in the ideas of the French based ICO group and this began to replace his enthusiasm for Solidarity, as the last chapters record. Finally , the most contentious episode is Joes expulsion from the London branch of the Solidarity organisation . Opinions still clash over this and readers will have to make up their own minds about the issue.